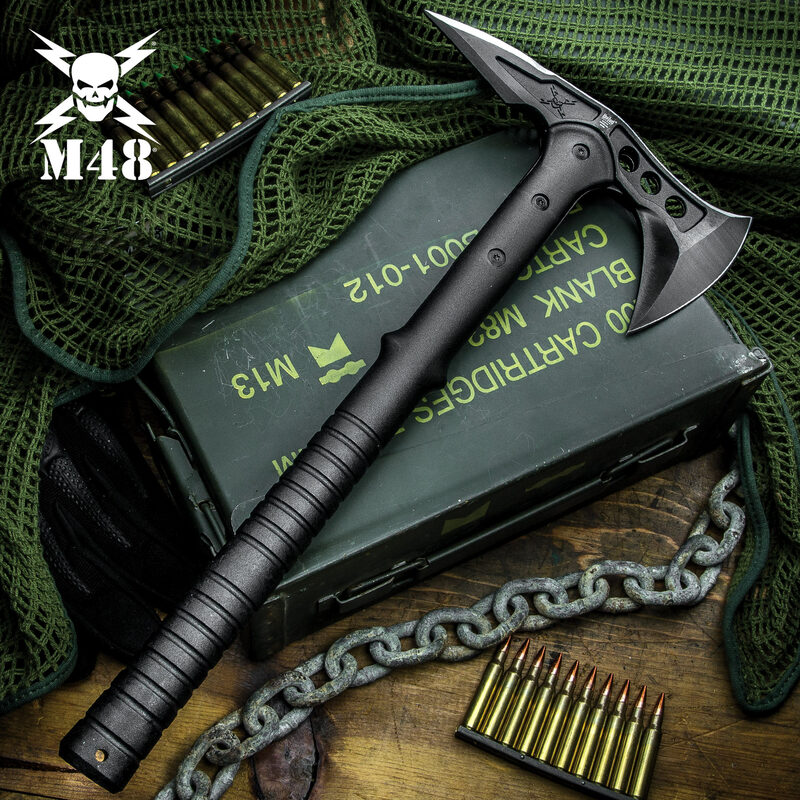 M48 Tactical Tomahawk Axe With Snap On M48 Sheath - Hawk Axe | BUDK.com - Knives & Swords At The Lowest Prices! 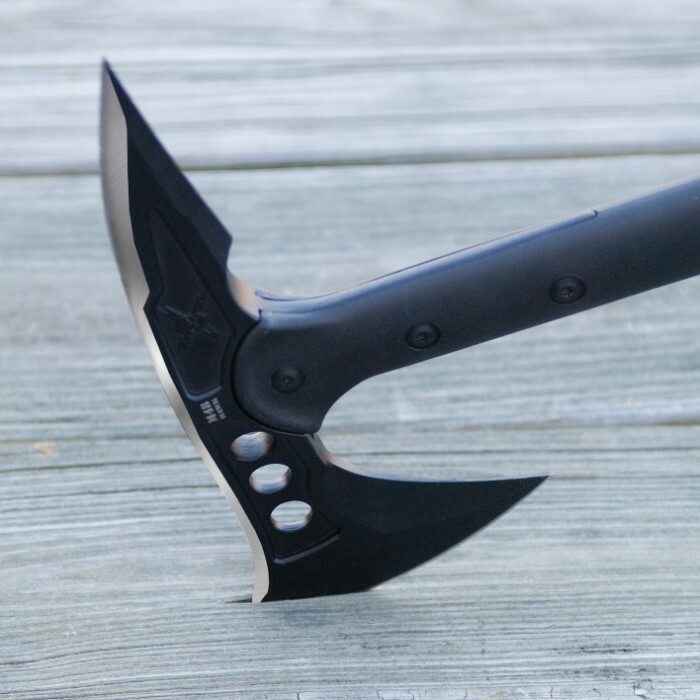 This M48 Tactical Tomahawk is the ultimate tactical tool. It's lightweight - designed to be carried all day without added muscle fatigue. 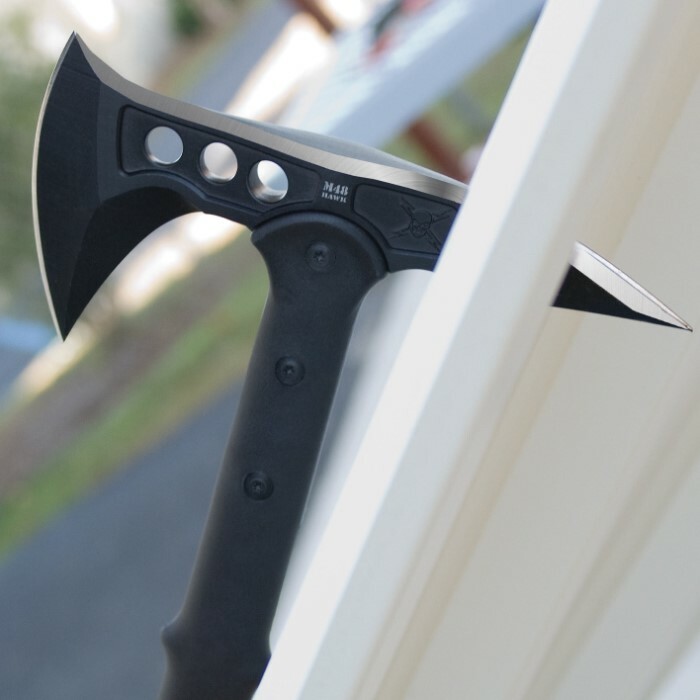 The blade offers a wide, upswept axe blade and a piercing spike on the back end. 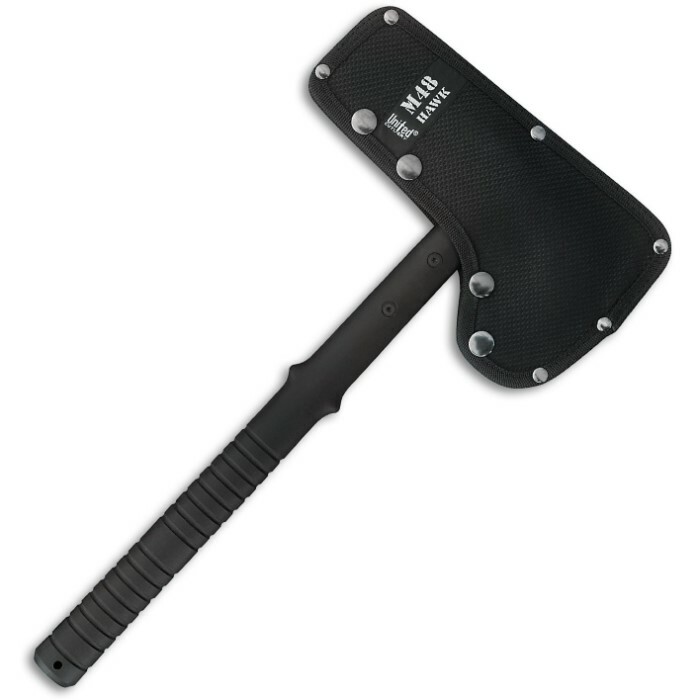 The 8" axe head is attached to the nylon reinforced fiberglass handle with three separate bolts. The 3 7/8" 2Cr13 stainless steel blade is precision cast, and a durable nylon sheath is included to house the blade. Looking for a tactical tool that really gets the job done? 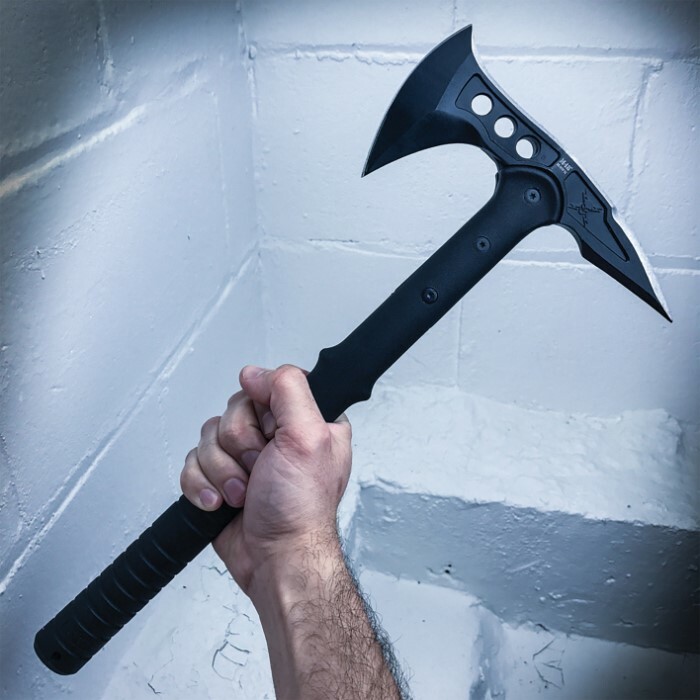 The M48 Tactical Tomahawk is exactly what you've been looking for! The residential are I live in was recently hit with heavy snow and a tree fell in front of my house, blocking my driveway and the street beyond. The road crew was unwilling to help me clear my driveway and I was left to my own devices. 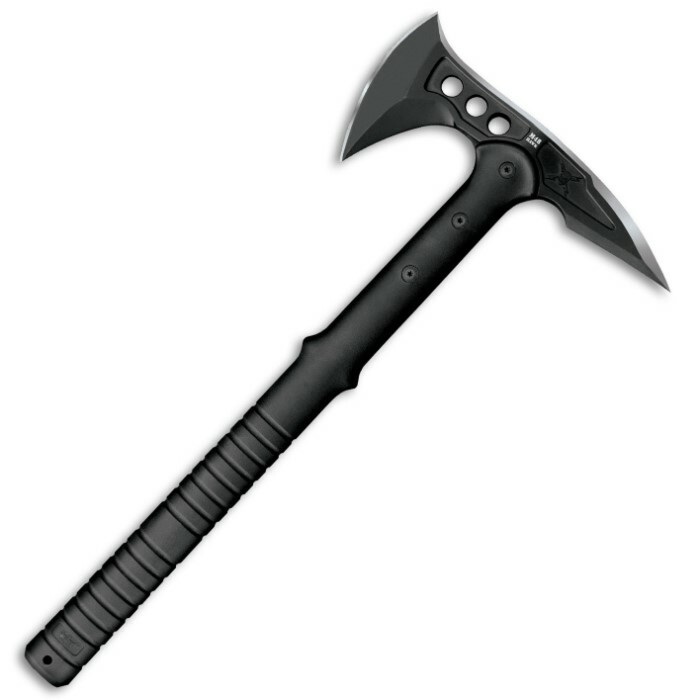 The M48 tactical tomahawk was the only tool I had for such a problem... And it passed with flying colors!! In less than half an hour, I was able to reduce the tree to manageable pieces. Which says a lot about the quality of its craftsmanship. Simply put - M48 gets the job done. I couldn't recommend them more. This item is one of my personal favorite items I ordered from this website. I highly recommend this item to anyone. I bought one a few years ago, and it works and handles as I'd hoped. Great tool and awesome defensive weapon if need be. I have also bought a couple of other brands like a sog, but the m48 is my favorite. I've had the m48 for over a year now and i take it with me camping for fun. The only complaint I really have about it is the sheath is poorly made. So far I've had three rivets pop out of it and two of the buttons no longer clasp all within the first month or so of use. I no longer keep it on my belt but instead in my ruck. I dont feel as badass without it on my side but it kept falling out or the blade would stick out just enough to scratch my hand when bushing by it. 10/10 would buy again but dont expect much of the sheath. I love it, tough, perfect balance, you can't go wrong owning this. I've had my M48 about two years and as far as chopping works great. thrown once in a while. Looks greaton video but this isn't really a throwing Hawk. If you want to throw it pick soft trees such as pine. Throw it at Hickory or an old Oak the out come is a broken handle. If you're into throwing there are Hawks made especially for that purpose with wooden handles so they can be easily replaced. Use the M48 properly it'll hold up and do the job. Such as putting holes in a 55 gallon steel barrel to make a burn barrel. When I feel like throwing a Hawk I have one made for that purpose. If the handle breaks I can just pick up another handle at the Hardware store. Every tool has it's purpose and the M48's isn't for throwing. But makes a great camp axe. I've had mine for awhile. About two months ago I decided to make a burn barrel out of a heavy gauge steel 55 gallon drum. I put over a hundred holes in that steel barrel. And the spike was still very sharp with out any signs of wear. It's keeps guard beside my bed. I've had this for a long time and I love it! It's sharp and the handle has a good feel to it. I've used and it and have never had any issues with it. Some people are complaining that it breaks after throwing it at dead trees, but they don't realize that these weren't made for dead trees. I definitely recommend this.